HI 504 introduces an innovative concept in pH and ORP control that enhances the entire line of process controllers engineered by HANNA. 30 years of experience in the production of industrial controllers have enabled us to develop this series of high performance instruments with our new Tele-control™ technology. This technology supplies the means to control, from whatever distance and in real time, one or more installations, allowing the user to optimize operations such as maintenance cycles. With two-way communication supplied by the RS485 output and Windows® compatible software, users can control the complete regulation process from the PC or through SMS via cellular phone. Programmable hold system pH/ORP Controller with Tele-Control™ and Sensor Check™. Measurement reliability is guaranteed by many self-diagnostic and troubleshooting functions, such as our Sensor Check™ feature which is the result of advanced research and application know-how. The use of a universal BNC connector allows the use of any type of industrial probe to be chosen for a specific application, while rendering probe replacement a simple and time saving operation. The HI 504 family offers a wide range of models, designed to fit your individual needs, and is able to satisfy whatever application of monitoring and regulation you require. The internal circuit of the instrument executes two independent tests, one for the probe and one for the reference chamber, measuring the respective impedance values every 5 seconds. These tests last for a very short period to avoid electrolysis and polarization, which can be caused by a prolonged exposure to an electric current. Heavy-duty applications often require almost continuous probe maintenance. Elements such as suspended solids, fat, oils, pigments and microorganisms can quickly deposit and soil the glass bulb of a pH probe, the sensor of an ORP probe or the reference junction. To solve these problems the HI 504 series has been equipped with an automatic cleaning system (simple or advanced, depending on model) with programmable cycles. The cleaning cycle is a simple wash with either water or detergent, programmed by setting the rinse time and the pause length. The Advanced Cleaning uses both water and detergent, and allows the user to program three stages, with the possibility to vary the sequence, the time, and the number of cycles. The advanced mode can also be triggered at any time from a remote control or through the isolated digital input on the rear panel, which can be connected to an external switch. The controllers can also automatically activate both cleaning modes whenever the sensor check reveals a soiled probe. It is possible to set a delay time before restarting the reading after a cleaning cycle has taken place; this allows the probe to adjust to the new operating conditions. The hold function allows the user to stop the regulating action of the controller for programmable time periods. It is possible to activate the hold periods in correspondence to programmed operations, such as plant maintenance, cleaning procedures and instrument calibration. HANNA exclusive Fail-safe Alarm System protects against problems caused by power supply failure or signal interruption, which are typical risks in industrial environments. The system acts both on a hardware and a software level. The alarm relay functions in a normally closed condition, and is tripped when there is a power failure if, for example, the power cable is accidentally cut. This function is very important in industrial plants where alarms are usually not activated if there is a power supply interruption, which can cause serious damage due to a loss of control of the process plant. At the software level, the fail safe function activates an alarm in case of abnormal circumstances, for example if the dosing contacts remain closed for an excessive period. The alarm condition is also signaled by a red LED, located directly on the front panel of the controller. With the HI 504 series, it is possible to recall the sequence of the last 100 occurred events at any time: errors, calibrations performed, set parameter changes and cleaning cycles. Every code shown on the display corresponds to a certain type of event, error or operation. Errors that are still active are indicated by a flashing code, while operations and alarms recorded or already concluded appear with a fixed code on the display. Analog Output: Data Logging or PID Dosage Control Models are available with one or two analog outputs. 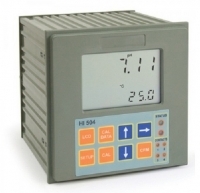 These outputs can be connected to a recorder for the cataloging of process data (pH/mV and temperature), or can be used for controlling dosing systems (pumps or electrovalves) using PID control. HI 504 can store date, time, pH or ORP and temerature measurements that can be transferred to a PC. The powerful HI 92000 software has graphing capabilities and can print graphs directly or save as a bitmap. Data can be exported in common spreadsheet formats.